(by Thomas Sowell, Townhall) – Polls indicate that the public is so disgusted with Washington politicians of both parties that a surprisingly large proportion of the people would like to get rid of the whole lot of them. It is certainly understandable that the voters would like to “throw the rascals out.” But there is no point in throwing the rascals out, if we are just going to get a new set of rascals to replace them. In other words, we need to think about what there is about current political practices that repeatedly bring to power such a counterproductive set of people. Those we call “public servants” have in fact become public masters. And they act like it. President Calvin Coolidge, with every prospect of being reelected in 1928, declared simply: “I do not choose to run.” Later, in his memoirs, he explained how dangerous it is to have anyone remain too long in the White House, surrounded by flattery and insulated from reality. What a contrast that attitude is with the attitude of the current occupant of the White House! The contrast extends beyond these two presidents. What we have today that we did not have in the early history of this country is a permanent political class in Washington — a Congress and an ever growing federal bureaucracy composed of people who have become a permanent ruling class. The first giant steps in this direction were taken in the 1930s, when the Great Depression provided the rationale for a radically expanded role of government that President Franklin D. Roosevelt and his followers had believed in before there was a Great Depression. Turnover in Congress has been reduced almost to the vanishing point. Political alliances within government and with outside special interests, as well as the gerrymandering of Congressional districts, make most incumbents’ reelection virtually a foregone conclusion. The ability to distribute vast amounts of largess to voters, at the taxpayers’ expense — President Obama’s giving away free cell phones during an election year being just the tip of the iceberg — further tilts the balance in favor of incumbents. This kind of government must constantly “do something” in order to keep incumbents’ names in the news. In short, big government has every incentive to create bigger government. Throwing the rascals out will not get rid of this political pattern. The first step in limiting, and then scaling back, government itself must be limiting the time that anyone can remain in office — preferably limited to one term, to make it harder to become career politicians, a species we can well do without. Thomas Sowell is a senior fellow at the Hoover Institution, Stanford University and the author of “Basic Economics,” ”Applied Economics” and “The Housing Boom and Bust.” Over the past three decades, Dr. Sowell has taught economics at various colleges and universities, including Cornell, Amherst, and the University of California at Los Angeles. Posted at Townhall.com on October 29, 2013. Reprinted here October 31, 2013 for educational purposes only. d) How do incumbents (current office holders) continually win re-election? 2. 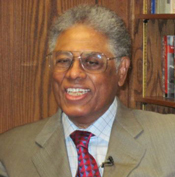 What does Thomas Sowell identify as a problem in his commentary “Throw the Rascals Out”? 3. a) What solution does Dr. Sowell offer? b) What do you think of this solution?